When my interpreting partner and I flew to another city recently to interpret, I asked him to lend me a novel for the trip. Once on the plane he pulled out “On Writing Well: The Classic Guide to Writing Nonfiction” by William Zinsser. It was not the choice I had expected but surprisingly it turned out to be as gripping a read as any good novel. What I like about the book is that Zinsser insists that good writing is a craft that can be learned and then he gives you all the tools you need to practise that craft. He tells you to write for yourself, to write as a human and then to rewrite and rewrite until your writing is pared down to a clear message. As a translator my work is about communicating other people’s messages. When I translate I have ample time to look up words, check expressions, match the style and tone of the author, even talk to the author and then polish, polish, polish. says Zinsser, and I totally agree with him. However, working as a simultaneous interpreter in the booth, I get one chance to interpret the words I hear in my headphones: the speaker never stops for me, I can’t check vocabulary, I can’t ask for clarification and I don’t get a second shot at any of my sentences. It’s both terrifying and exhilarating; it’s what attracts those of us who love the profession and deters those who would prefer more time. Time is never on our side in the booth. 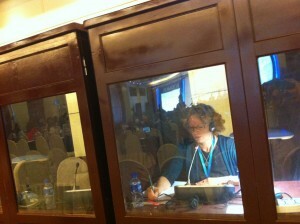 The other morning I had five minutes to speed-read the opening speech before the start of the conference. Faced with a speech that the speaker, or his speechwriter, had probably rewritten many times, what could I do in five minutes? “The perfect ending should take your readers slightly by surprise and yet seem exactly right”. I don’t want to be rewriting that line on the spot in my head, I want to have prepared it beforehand so that I too, can look up, and say it with conviction. Mostly we are not lucky enough to see a speech beforehand! The best speeches to interpret are those that have been constructed with a clear logical thread running through them, where you can hear the human behind the words and where those words have been written – and rewritten – with care. If you’re itching to read more, check out our Top 10 Books on the English Language for even more great book suggestions. Alternatively, if apps are more your thing, check out this killer list of Top 10 iPad Apps for English Learners. Describing the Great Wall of China in 15 words or less? This entrepreneur has got simple writing down to a pat.